For over 7 years, our wonderful customers have been asking us questions about the healthy cookies we make. This page offers short and sweet answers to the most commonly asked questions. 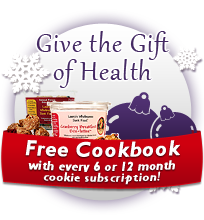 1) Do you have any healthy cookie recipes? As a matter of fact, so many customers asked for this that I created The Wholesome Junk Food Cookbook. It is available nationwide. 2) I'm on weight watchers can I eat these? Sure. You know how to calculate points and our cookies tend to be about 1 point per cookie (or less for the cashew cookie). Check out Hungry Girl plugging our cookies. 3) How do people eat these cookies? Some like them plain. I eat them by halves. Others dip in milk. One friend microwaves or warms briefly to melt chocolate. A customers said she sprinkles on ice-cream or yogurt, another eats with cream cheese and someone else puts a little whipped cream. 4) How long do they last? They are best if eaten before 6 months after the bake date. Once you break the safety seal and are opening and closing them, about 2 weeks. 5) Can I refrigerate or freeze these? Sure. This can help them stay fresher longer. 6) What does non-gluten ingredients mean? That means that our ingredients do not naturally contain any gluten for these varieties. We use rice flour, tapioca starch and rice syrup. 7) What is the difference between saturated and unsaturated fats? Saturated fats are solid at room temperature and unsaturated are liquid at room temperature. Trans fats from artificially saturated fats – so fats that, in their natural state, were liquid but had hydrogen pumped into to them to extend their shelf life – not good for your body but done to save money by some companies. 8) How much cholesterol is in the cookies? Zero. Cholesterol comes uniquely from animal products and we are totally vegan so we have no cholesterol. 9) What is the difference between vegan and vegetarian? 10) If there is no dairy, why is it kosher dairy? The equipment is thoroughly cleaned yet the bakery does make products that use eggs and/or dairy. Some Kosher supervisions have a special “DE” that stands for “Dairy Equipment” however, Kof-K does not. The three designations they can give are meat, dairy or parve (no animal products used on equipment). Wheat-free means that we do not use any wheat in the product. In this case, we use oat flour instead of wheat flour. Many people are sensitive to wheat and need to avoid it. 12) My child is very allergic to nuts, can they eat your cookies? That is such a difficult problem to have as a parent. Because our products are made in a facility that also processes peanuts and tree nuts, I do not recommend eating our cookies if anyone is sensitive or allergic to nuts. 13) Can I use these for workouts? Yes! We have triathletes, cyclists, runners, rowers nationwide using our cookies for training and racing. Our cookies are perfect for pre gym workout, walk or tennis. Very body friendly and provides a nice sustained energy. 14) Is it okay to leave them my car or desk at work? I get emails from people who keep a tub in their desk drawer at work, carry them when they are hiking or on a road trip. One gentleman with diabetes keeps a tub in his car so when he is stuck in traffic commuting home and he feels his blood sugar dropping, he has something there. Use your common sense when leaving in a hot car. Heat or moisture can impact food. 15) Do you have any flavors you recommend for kids? What I have heard from parents is that kids tend to like them all. Many parents feel good about giving any flavor to them since we do not use cane sugar. I’d say banana and chocolate chip and the cashew chocolate chip are kids favorites, yet any kids who like thin mints, will like the mint double fudge. Our just for kids sample set has raisin and banana for parents looking to limit chocolate. 16) What does non-GMO mean? It means not genetically modified. It is a step below organic and above the regular. It means that no scientist has gone in and engineered any changes. It is like saying “really natural”. Non- GMO is more expensive but I feel better using it. 17) What is expeller pressed oil and why is it better for me? Expeller pressed means that pressure was used to get the oil out. A cheaper way of getting oil out is by using solvents or chemicals to pull them out. The concern is that there may be residue or left over chemicals after the process remaining in the oil. Expeller is more expensive but I feel better using it. 18) What does refined and unrefined mean for grains and sweeteners? Refined sugar would be cane sugar and refined flour would be white flour. They are much less expensive than dates, whole sugar, oats and rice syrup, but I feel better using it. Refining means how many nutrients were removed and how many processes have been done on the product. I feel better when I eat a less refined diet. 19) What does portion control mean - I want to feel satisfied? Portion control means not over eating and knowing which foods it is okay to eat more of. For example, it would be better to have more salad than French fries. Many people get confused because we buy a muffin, read 250 calories then don’t read the fine print that said that muffin is THREE serving. You accidentally ate 750 calories! Our bite-lettes ® are already in helpful small portions and are about 50 calories each. 20) Why do your chocolate chip melt so easily and smear against the container? We have healthy and natural cocoa butter in our custom made chocolate chips that is easy to digest. Most often, chocolate that is hard to melt has hydrogenated fats with trans fats. Easy to store and transport, not good for your body. Our custom made chocolate chips are made with unrefined sugar that retains many of its trace minerals and nutrients. It costs more but I feel better using these. 21) What type of banana do you use? We use both banana flaked and banana puree. I love our banana bite-lettes ® and we wanted it to have the banana bread taste. 22) I've heard there are sprays on coconut, does your coconut have sprays? Most coconut has sodium bisulfate sprays to both keep it white and keep it from caking. I don’t feel good about chemical sprays on food for cosmetic reasons so I had to find special coconut that does not have it. The supplier was surprised we wanted that but I feel better using it. I’d rather have 100% natural coconut that might stick together a little bit or not be perfectly white and know it is free from chemicals. 23) How did you choose your chocolate? It is so good. I tried about 12 different chocolate from many different companies. Fun job. I tasted each and every one and picked the one that lingered in my mouth tasting chocolaty the longest. I wanted my chocolate loving customers to have a rich and decadent experience. 24) What is a rice dextrin? It is a fancy word for rice syrup. I want to write plain old “rice syrup” but the company I buy it from says I have to say “dextrin” to be accurate. 25) Isn't evaporated cane juice just regular sugar? No, regular white sugar has been highly refined from sugar cane juice into white sugar and molasses. If you ever look at the nutritionals for white sugar, there are no vitamins and minerals, just empty calories. If you look at molasses, it has iron, vitamins, nutrients. Evaporated cane juice crystals, like we use, still have trace minerals and vitamins. It costs more than white sugar but I fell better using it. Dates are our primary sweetener. They have so many good vitamins and nutrients. 26) What is different about your baking powder? We use special non-aluminum baking powder. There has been some question about aluminum in the diet so I feel better using this kind. 27) Why do you use sea salt? Unrefined salt also has its trace minerals intact and I feel better when I consume it versus traditional table salt. 28) Why are your cookies so expensive? When you buy a case of 6 tubs you actually have about 90 cookies or enough for 45 people to have 2 each. Our ingredients are very high quality and I eat about 1-2 per day so a tub lasts me about 7-10 days. Each tub has about 15 delicious cookies and I often break one in half to get the sweet taste I want. Many people will spend $1-2 per day on snacks that are not good for them. Our treats are satisfying, healthy and cost much less than that.